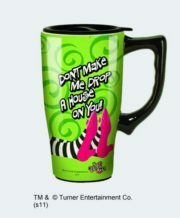 This is a 12 ounce ceramic coffee mug that features the Wicked Witch of the East ‘Don’t make me drop a house on you’ from the movie Wizard of Oz. This is a 14 ounce ceramic travel mug that features the Wicked Witch of the East ‘Don’t make me drop a house on you’ from the classic movie The Wizard of Oz. 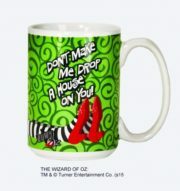 This is a 15 oz, stainless steel lined, acrylic, insulated travel mug that features the Wicked Witch of the East ‘Don’t make me drop a house on you’ from the classic movie The Wizard of Oz. 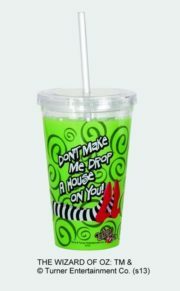 This is an 18 ounce acrylic travel cup with a straw that features the Wicked Witch of the East ‘Don’t make me drop a house on you’ from the movie Wizard of Oz. 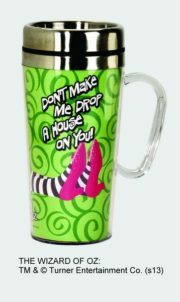 This is a stainless steel travel can style mug featuring the Wicked Witch of the East ‘Don’t make me drop a house on you’ from the classic movie The Wizard of Oz. It comes with an attached sippy straw and a protective box. This is a stainless steel 18 ounce water bottle with a purple wrap around background featuring the image of the Wicked Witch with the phrase “I’m a witch. What’s your excuse?”. It comes in an illustrated box. Produced by Ata-Boy this is a licensed 2.5″ X 3.5″ photo magnet bearing an image of Dorothy, the Lion, Tin Man and Scarecrow under the phrase “We’re on our way to see the Wizard” from the cult movie classic The Wizard of Oz. This is a new, never used magnet stored in a smoke and pet free environment. 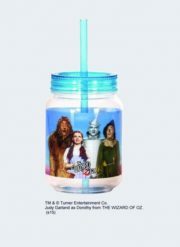 This is a 12 ounce mini mason jar with a straw that features the art image of the cast from the movie Wizard of Oz. 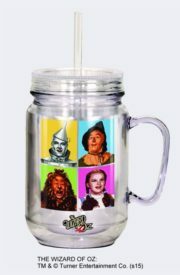 This is a 16 ounce mason jar with a straw that features the pop art images of the cast from the movie Wizard of Oz. This is a 12 1/2″ x 16″ heavy grade tin sign that reproduces the 70th anniversary poster from the cult classic movie The Wizard of Oz. These are produced in the style of the original tin signs that were common in the first half of the 20th century, including corner wear and rust to give it a vintage look. It is complete with pin holes in the corners for easy hanging. These also look very nice framed. Because they are painted tin signs sometimes there might be very light scratching nears the corners. 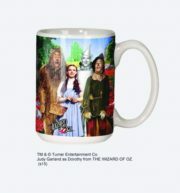 This is a 12 ounce ceramic coffee mug that features the Fab 4 cast from the movie Wizard of Oz with the Emerald City in the background. 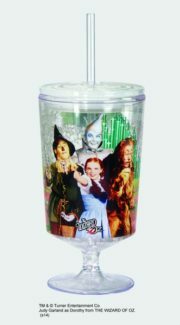 This is an illustrated, clear, acrylic, gel freezer goblet featuring the character images of the cast from the popular movie The Wizard of Oz. 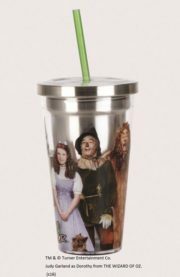 This is an 18 oz, clear, stainless steel lined travel cup with straw featuring the classic image of the cast from the movie The Wizard of Oz. Hand was recommended. Produced by Spoontiques, this is a decorative visor clip featuring the image of the cast from The Wizard of Oz. 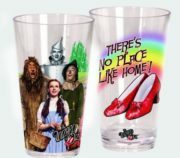 This is a set of two 20 ounce clear acrylic cups featuring the photo image of Dorothy, the Tin Man, Scarecrow and Lion on one and the ruby slippers on the other, from the classic movie The Wizard of Oz. 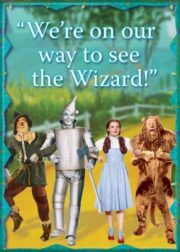 Produced by Ata-Boy this is a licensed 2.5″ X 3.5″ photo magnet bearing an image of the main cast walking on the yellow brick road from the cult movie classic The Wizard of Oz. This is a new, never used, magnet stored in a smoke and pet free environment. 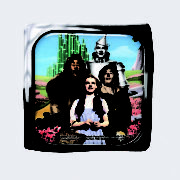 Produced by Ata-Boy this is a licensed 2.5″ X 3.5″ photo magnet bearing an image from the cult movie classic The Wizard of Oz. This is a new, never used, magnet stored in a smoke and pet free environment. This is rubber ice cube tray with eight holes in the shape of the faces of the characters Dorothy, Cowardly Lion, Tin Man and Scarecrow from the original version of the hit movie The Wizard of Oz. 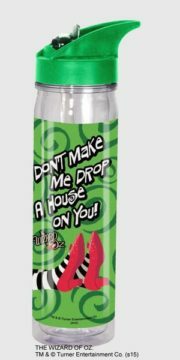 This is an 18 ounce clear plastic water bottle featuring a wrap-around design of the legs of the Wicked Witch of the East under the words “Don’t Make Me Drop A House On You”. from the classic movie The Wizard of Oz. Standing 11″ tall, it has a spill proof sport lid with a sippy straw and a new flip-top design. 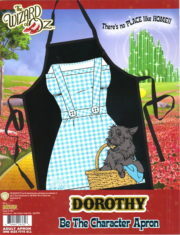 This is a black, white, light blue, grey and brown polyester adult apron featuring the body image of the dress and bag with Todo, of Dorothy from the hit movie The Wizard of Oz. 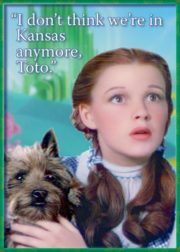 Produced by Ata-Boy this is a licensed 2.5″ X 3.5″ photo magnet bearing an image of Dorothy saying “I don’t think we’re in Kansas anymore, Toto.” from the cult movie classic The Wizard of Oz. This is a new, never used, magnet stored in a smoke and pet free environment. Produced by Ata-Boy this is a licensed 2.5″ X 3.5″ photo magnet bearing an image of the good witch Glinda saying “Are You A Good Witch Or A Bad Witch?” from the cult movie classic The Wizard of Oz. This is a new, never used, magnet stored in a smoke and pet free environment. 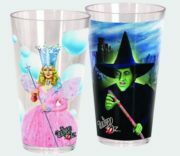 This is a set of two 20 ounce clear acrylic cups featuring the photo images of Glinda the Good Witch on one and the Wicked Witch of the West on the other, from the classic movie The Wizard of Oz.